The place to relax, enjoy food and activities to your heart's content, all year round -- Niseko. Niseko is the perfect resort for outdoors lovers. Powder loving skiers and snowboarders flock to Niseko from around the world during winter. In summer, many activities to immerse yourself in the beautiful nature - rafting and water activities, climbing at Mt.Yotei and the Niseko mountain range, mountain biking - are waiting for you here. You can also enjoy Niseko as a relaxing getaway resort. Choose from a variety of hot-springs, lounge at the rustic cafes where time seems to pass a bit slower than back home, and enjoy the dishes made from fresh local vegetables at one of the many restaurants. 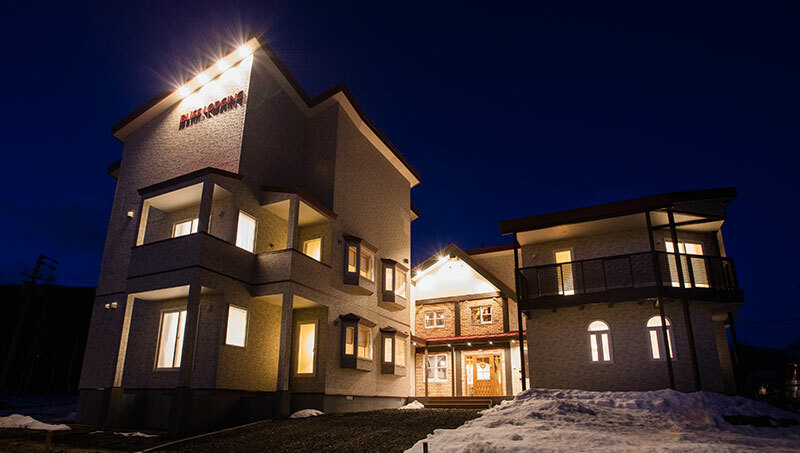 Bliss Lodging is located in a quiet, peaceful area just a 15-minute walk from Grand Hirafu, the largest slope in the Niseko area. A free ski shuttle bus providing access to the 2 main slopes as well as the main town 'Hirafu Village' which offers many places to dine and shop, is operated from the morning until the evening skiing period. You can take on the world-famous powder all day long and find a lot of fun afterwards too. We offer a new style of accommodation which combines modern conveniences and privacy of a condominium, and homely service best recognizable by our original communal events we organize for our guests. We strive to offer you friendly and cordial service to bring you a truly "BLISSful" stay. Make Bliss Lodging your home away from home! 2. Free Ski Shuttle Bus Stop is literally steps from our door! The Niseko area has 4 ski resorts and draws skiers seeking top quality powder from all over country and beyond. Grand Hirafu, which boasts the most courses, and Hanazono Resort, which is perfect for beginners and families, are particularly popular. 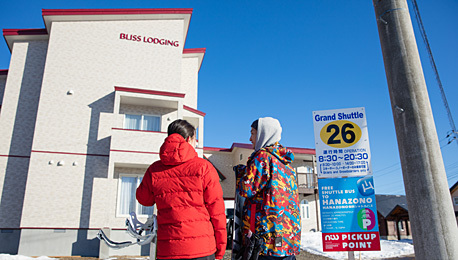 A free shuttle bus service to both skiing areas is available just steps from Bliss Lodging's front door. The bus ride to Grand Hirafu's gondola lift station takes only 5 minutes, so there's no need to lug around heavy skis and boards. A shuttle bus for Hanazono also stops at the same point. Pick from the variety of powdery slopes every day depending on the weather and your mood. The choice is yours! 3. Have a memorable time at the winter-season only Bar Lounge. 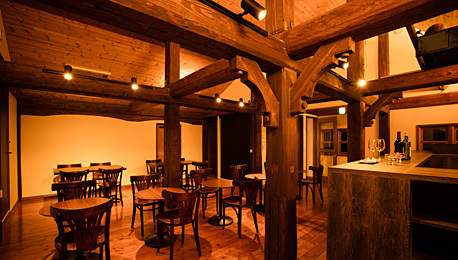 The Bar Lounge features natural wood beams and pillars and has the atmosphere of a cozy mountain cabin. It's the perfect place to unwind after an active day out. Our unique organized events are also held here several times a week. The lounge is equipped with a 100-inch projector so you can play back that footage you took on the slopes. Share your day's events, meet new friends and get to know our staff. Come on and enjoy a unique experience only Bliss Lodging can provide! *Photos and videos of past events can be found on Bliss Lodging's Facebook page. 4. Helpful facilities and services for a comfortable Niseko holiday. You can choose from a variety of room types depending on the number of guests and your length of stay. 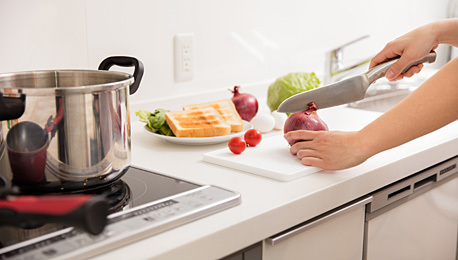 All our rooms are furnished with a kitchen, bathroom, refrigerator, microwave oven, electric kettle, tableware and utensils. We also provide, ski storage, washing and drying facilities, pick-up/drop-off service, a coffee machine, food pack service, Supermarket Drop By Service and Wi-Fi. We strive to make Bliss Lodging the best choice for your vacation.